Ulster County residents could elect to bypass legislators and task a local committee with redrawing county lines. 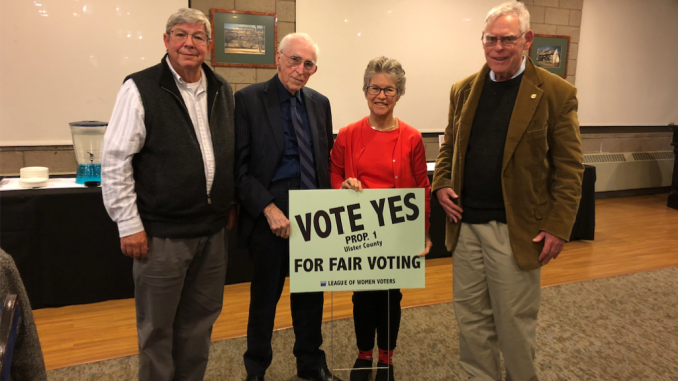 A forum was held on Wednesday, Oct. 24 from 7 p.m. to 9 p.m. to advocate for this proposal, which has received unanimous approval from the eleven members of the Ulster County Charter Revision Commission (CRC). These commissioners included Gerald Benjamin, Rod Futerfas, Thomas Kadgen and Dare Thompson. The group among a small audience in the College Terrace at SUNY New Paltz. They served as proponents for this amendment in their shared discussion. This forum was organized by the League of Women Voters of the Mid-Hudson Region, a nonpartisan political organization. They invited CRC members to discuss and explain this proposal as a panel. The purpose of this proposal is to avoid gerrymandering, a practice that supposedly serves to manipulate district boundaries in order for one party to withhold political favor over others. This proposal was created in 2001. However, when it was first set forth, Benjamin, who served on both the original and current commission, forgot to specify for this proposal to “go directly to ballot.” The state legislature then obtained authority over whether or not the ballot would be submitted to voters, according to Benjamin. If passed, seven county residents will be selected to serve on this commission, with geographic and racial diversity in mind, according to the proposal. The county legislature and county executive would select four commissioners, who would then appoint the remaining three members. Additionally, elected officials, municipal employees and officers of a political committee would not be able to become commissioners, as this proposal is intended to exclude political influence from the process of reviewing and redrawing county legislative districts. These members would be chosen in 2021, who would then have two years to produce a map of the 23 Ulster County districts, according to Kadgen. These district boundaries are also required to be redrawn, with each U.S. decennial census, in order to ensure fair and equal representation of all residents. The adoption status of this proposal will ultimately be decided by the majority vote of Ulster County residents on Nov. 6.